Looking for proper Mixing Bowls in your kitchen? 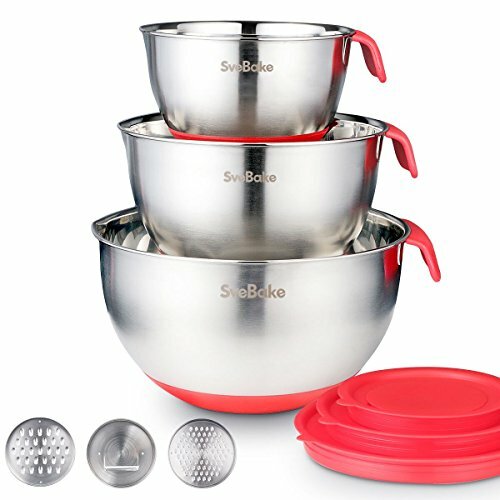 SveBake Mixing Bowl Set is your choice. ♦NON-SLIP Handles & Base stabilize mixing bowls while mixing/blending/beating. ♦ INNER MEASUREMENT helps you measure quickly and accurately. (In Quarts and Liter). Wide Slicer: Suitable for slicing firm vegetables, cheeses or fruits into thin and even slices. Medium Holed Shredder: Perfect for soft cheeses, vegetables, and general shredding. Small Grater: Ideal for grating hard cheeses or pulping hard vegetables. ♦ INTEGRATED SPOUT makes it easy to pour mixture straight out of the mixing bowl. Material: Quality food-grade stainless steel. ♦ USE FOR MIXING OR STORAGE - These Mixing Bowls are essential kitchen tools for mixing and storage. Mixing Bowl Set of 3 includes 1.5 QT, 2.5 QT, 5 QT Bowls&lids and 3 grater discs. ♦ QUALITY MATERIAL - These Mixing Bowls are made by food-grade stainless steel, with non-slip base & handles, integrated spout makes it easy to pour mixture straight out of the mixing bowl. ♦ PRACTICAL GADGET - Our convenient to insert grater system includes wide slicer, medium holed shredder, and a small grater, they help you to grate, shred and slice with mess-free precision. If you have any questions about this product by SveBake, contact us by completing and submitting the form below. If you are looking for a specif part number, please include it with your message.